With a couple days left to fish, we’re closing in on the end of leg 1! It’s that point in the leg when everything begins to look familiar and routine may have taken over. But if you’re patient and keep your eyes open, you’re sure to see something. With that said, here are some highlights from the last couple of days! 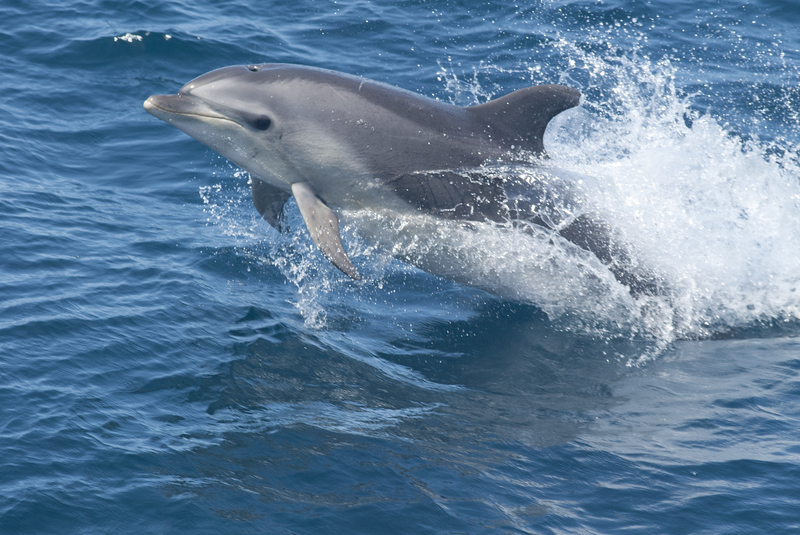 We woke up to an announcement that a large pod of common dolphins were jumping and swimming straight towards the boat. There were at least 50 of them! The whole show lasted 5-10 minutes, and just like that, they were gone. It’s amazing how quickly these sightings come and go. We’ve been sampling in deeper water these last couple of days, and a neat Scorpaenidae fish came up in the net. It may look similar to our black belly rosefish, Helicolenus dactylopterus, but there are some noticeable differences. This fish is a bright orange color and has one extremely long dorsal spine. When the mouth is open, you’ll see a bright yellow throat while the blackbelly rosefish’s is, as you would expect, black. Some lobsters we catch have lost one or both of their arms. Though, it’s not a permanent state because they can be regrown, and that’s exactly what one of the lobsters we caught was doing! At first glance, it may seem like it has only one arm, but look closer, and you can see that a replacement arm has just started growing. At another station, we caught a beautiful starfish. We are wondering if it belongs to the genus Coronaster. This animal has 11 delicate arms and is an orange-red color. After pictures were taken, some arms were detached. It seemed odd for that to happen so quickly and after minimal handling. Perhaps it could be some kind of defense mechanism. It will be brought back to the lab for further identification. Coronaster is a species of starfish, or sea star. Photo credit: NOAA Fisheries/Christine Kircun. A benefit of being on day watch, noon to midnight, is the chance to witness amazing sunsets. When the weather is just right, the sky can be remarkable, and it’s difficult to resist taking a moment to be still and enjoy the view. Some day watch scientists, watching the sunset after working up a station. Left to right: Kelcie Bean, Zackery Fyke, Lacey Bluemel, and Jennifer Casey. Day 15 – July 11: Another beautiful day. We finished up line 47 and completed about half of line 26 (our two most southern and offshore lines). Our sightings were mostly of squid-eating species: Risso’s dolphin, sperm, pilot, and unid beaked whales. We also had some Atlantic spotted, bottlenose, and rough-toothed dolphins. A group of rough-toothed dolphins came to the bow and, though they weren’t there very long, Pete collected another sample! Pete’s been doing biopsies for a long time and that’s the first time he’s every darted a rough-tooth. Day 16 – July 12: Windy, windy, windy. Everywhere. So, we stayed put where we were and got caught up on data, movie-watching and naps. Day 17 – July 13: Completed line 26 in excellent conditions. More Atlantic spotted, striped, and Risso’s dolphins. Also some great looks at a large group of pilot whales. Timing worked out so that just as we finished surveying for the day, the engineers were able to take over and utilize our transit towards some inshore lines to take care of some of their routine maintenance needs. Day 18 – July 14: Windy, windy, windy. Everywhere. Again. We had given it the ol’ college try, but were out of options, so decided to head back to the barn. After some initial scrambling to prepare for an early arrival, we were greeted at the dock by friendly faces and welcoming arms. 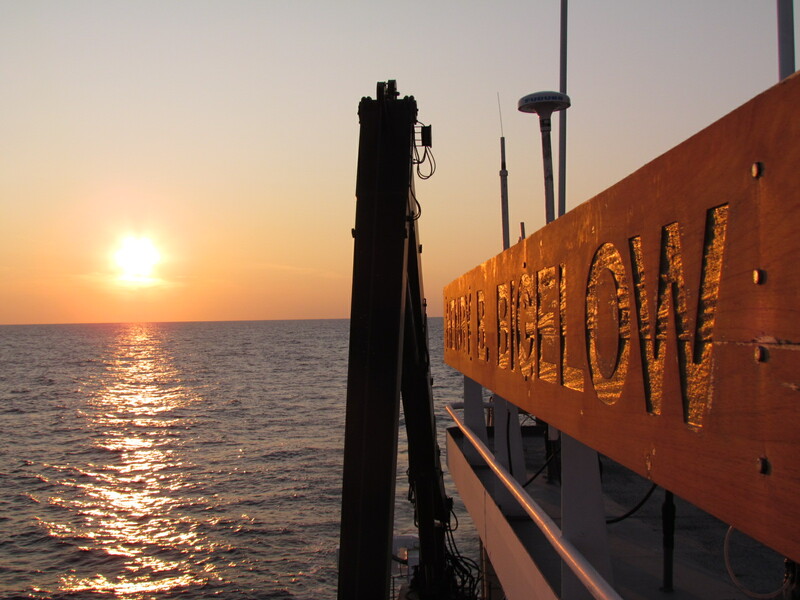 Thanks to all of the scientific and Bigelow crew for making this leg such a success!